Cannot be Normal Summoned/Set. Must be Special Summoned (from your hand) by banishing 1 LIGHT and 1 DARK monster from your GY. You can pay 1000 Life Points; send as many cards in both players' hands and on the field as possible to the GY, then inflict 300 damage to your opponent for each card sent to the opponent's GY by this effect. You cannot activate other cards or effects during the turn you activate this card's effect. This monster appears in the artwork of Chaos Seed. This card has a Pendulum/retrained counterpart: Chaos Emperor, the Armageddon Dragon. This card is arguably responsible for the existence of the Forbidden status. Due to this card's effect, it played a crucial role in the Yata-Garasu Lockdown, which led to Konami creating the Forbidden status in August 2004. In fact, this card and Victory Dragon are very similar, both being Level 8 DARK Dragons that had a crucial role in the game's history. 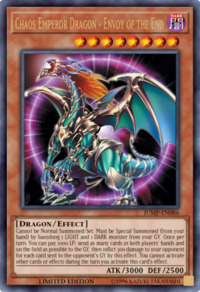 Victory Dragon started the Match Winner series, while this card led to the Forbidden status being made. This card was the first Dragon monster to have been Forbidden. Both Black Luster Soldier - Envoy of the Beginning and this card have a less powerful version of themselves known as the Sky Scourges, Sky Scourge Enrise and Sky Scourge Norleras respectively. The Sky Scourges have similar effects and Summoning requirements to the Envoys as well, although the removal of monsters from the Graveyard is both Type and Attribute-specific. In addition to the Sky Scourges, Ruin, Queen of Oblivion and Demise, King of Armageddon have effects based on the Envoys, with the latter based on this card. The background circle on this card and Black Luster Soldier - Envoy of the Beginning makes reference to DARK and LIGHT. Chthonian Emperor Dragon has its appearance and English name based on this card. In Yu-Gi-Oh! GX, Bastion Misawa states that this card is so powerful that it has been banned from official tournaments, making it one of the few cards that is Forbidden both in the anime and the real-life card game. Oddly enough, despite this Kaiba uses this card against Zigfried von Schroeder during his Grand Championship, suggesting that either this card was banned after this Duel occurred or that it didn't matter since their Duel wasn't an official match of the tournament. Cannot be Normal Summoned/Set. Must be Special Summoned (from your hand) by banishing 1 LIGHT and 1 DARK monster from your GY. Once per turn: You can pay 1000 LP; send as many cards from both players' hands and fields to the GY as possible, then inflict 300 damage to your opponent for each card sent to your opponent's GY by this effect. You cannot activate other effects the turn you activate this effect. When this effect is activated, all cards in both players' hands and on the field are sent to the Graveyard, including "Chaos Emperor Dragon - Envoy of the End". This effect will inflict 300 damage for each Monster, Spell or Trap Card sent to the opponent's Graveyard, from the point of view of the player who activated the effect of "Chaos Emperor Dragon - Envoy of the End". If the activation of the effect of "Chaos Emperor Dragon - Envoy of the End" is negated by your opponent's "Divine Wrath", you can activate other card effects during the same turn. If the effect of "Chaos Emperor Dragon - Envoy of the End" is negated by your opponent's "Effect Veiler", you cannot activate other card effects during the same turn. : If the activation or the effect of "Chaos Emperor Dragon - Envoy of the End" is negated, can you activate other card effects? If the activation of the effect of "Card Trooper" or "Monster Reborn" is negated by your opponent's "Light and Darkness Dragon", you can activate the effect of "Chaos Emperor Dragon - Envoy of the End" during the same turn. If the effect of "Card Trooper" or "Monster Reborn" is negated by your opponent's "The Fabled Unicore", you cannot activate the effect of "Chaos Emperor Dragon - Envoy of the End" during the same turn. : If the activation or the effect of "Card Trooper" or "Monster Reborn" is negated, can the effect of "Chaos Emperor Dragon - Envoy of the End" be activated? Since you cannot activate other card effects during the turn the effect of "Chaos Emperor Dragon - Envoy of the End" is activated, if you gain the effect of "Chaos Emperor Dragon - Envoy of the End" using the effect of "Phantom of Chaos", you cannot activate the effect of "Chaos Emperor Dragon - Envoy of the End". : If the name and effect of "Chaos Emperor Dragon - Envoy of the End" is gained by the effect of "Phantom of Chaos", can the effect be activated? "Chaos Emperor Dragon - Envoy of the End" sends itself to the Graveyard as part of its effect, and counts itself for determining how much damage it inflicts. The damage that "Chaos Emperor Dragon - Envoy of the End" inflicts is equal to the number of cards both players send to the Graveyard times 300 points. "Barrel Behind the Door" and "Trap of Board Eraser" can be chained to "Chaos Emperor Dragon - Envoy of the End"s effect. "Barrel Behind the Door" is, itself, sent to the Graveyard by "Chaos Emperor Dragon - Envoy of the End"s effect and counts for an additional 300 points as a result. If "Chaos Emperor Dragon - Envoy of the End" is destroyed or removed from play by an effect chained to its own effect, its effect still resolves. Tokens will be removed from the field by "Chaos Emperor Dragon - Envoy of the End's" effect, but will not add to the damage total because they are not sent to the Graveyard. It is the controller, not the owner, of "Chaos Emperor Dragon - Envoy of the End" that can activate its effect and that inflicts damage to their opponent. If you control your opponent's "Chaos Emperor Dragon - Envoy of the End" and you pay the 1000 Life Points, the effect inflicts damage to your opponent even though the monster returns to your opponent's Graveyard. If "Waboku" is chained to the effect of "Chaos Emperor Dragon - Envoy of the End", it will not prevent the damage because "Waboku" only applies to Battle Damage. Also, "Waboku" will still be on the field when "Chaos Emperor Dragon - Envoy of the End's" effect is applied, so it will still count for 300 points of damage to the opponent. When "Minar" and "Electric Snake" are sent to the Graveyard by "Chaos Emperor Dragon - Envoy of the End", their effects are not activated because the modified text on those cards says when they are "discarded to the Graveyard from the hand". Barrel Behind the Door:" You can activate "Barrel Behind the Door" against Ignition Effects like "Chaos Emperor Dragon - Envoy of the End". Big Burn:" You can only activate "Big Burn" when an effect that removes monsters in the Graveyard is activated. So you can't activate "Big Burn" when a player removes monsters in the Graveyard as a cost to Special Summon "Chaos Emperor Dragon - Envoy of the End"
Chosen One:" You may not select a monster that can only be Special Summoned by a specific effect for this card's effect, such as a Ritual Monster, "Chaos Emperor Dragon - Envoy of the End" If the only Monster Card in your hand is a monster such as these, then you cannot activate "Chosen One". D.D. Scout Plane:" If "D.D. Scout Plane" is destroyed by "Dark Ruler Ha Des" and then removed from play to Special Summon "Chaos Emperor Dragon - Envoy of the End", "D.D. Scout Plane"s effect activates and it will be Special Summoned. Dark World: These effects only activate if the cards are discarded by a card effect. They will not activate if sent to the graveyard by a card effect like “Chaos Emperor Dragon – Envoy of the End”. 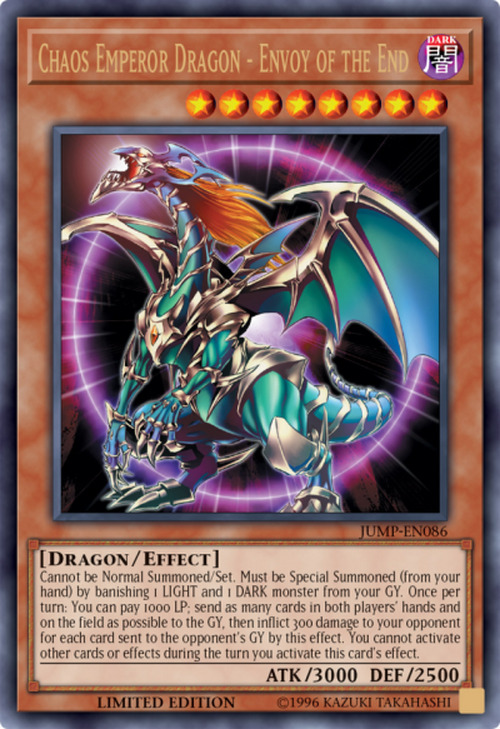 Dimension Fusion:" "Dimension Fusion" cannot Special Summon a "Special Summon-only" monster, like"Chaos Emperor Dragon - Envoy of the End", unless it was properly summoned first. Elephant Statue of Blessing / Elephant Statue of Disaster:" "Elephant Statue of Blessing"s effect activates when sent from the hand to the Graveyard by the effect of "Chaos Emperor Dragon - Envoy of the End". Enemy Controller:" When the Ignition Effect of"Chaos Emperor Dragon - Envoy of the End" is activated, and you chain "Enemy Controller" to take control of the"Chaos Emperor Dragon - Envoy of the End", even if you take control of the monster, you cannot take control of the effect itself. So if your opponent activates"Chaos Emperor Dragon - Envoy of the End"s effect, and you chain "Enemy Controller", you still take the damage from "Chaos Emperor Dragon - Envoy of the End". Gemini Imps: You cannot activate the effect of “Gemini Imps” in response to effects that “send” cards in your hand to the Graveyard, like “Chaos Emperor Dragon - Envoy of the End”. Last Turn:" You cannot Special Summon a monster for "Last Turn" that is a "Special Summon-only" monster like "Chaos Emperor Dragon - Envoy of the End" Nor can you select a Spirit monster because they cannot be Special Summoned. Skill Drain:" Conditions for Summoning monsters is not negated by "Skill Drain", so you still must remove 1 DARK and 1 LIGHT monster to Special Summon "Chaos Emperor Dragon - Envoy of the End"
The End of Anubis:" "The End of Anubis" WILL NOT negate the Special Summon of "Chaos Emperor Dragon - Envoy of the End", . (because these involve costs, not effects, and "The End of Anubis" cannot negate paying costs). If "Chaos Emperor Dragon - Envoy of the End" is Special Summoned, and the controller immediately activates its effect, and the opponent chains "Torrential Tribute" as Step 2 of a Chain, "Torrential Tribute" destroys all monsters on the field and sends them to the Graveyard, then "Chaos Emperor Dragon - Envoy of the End"s effect resolves, sends all Spell & Trap Cards on the field to the Graveyard, and inflicts 300 points of damage to the opponent for each Spell & Trap Card sent to the Graveyard by its effect. (Monster Cards do not count toward the damage because they were destroyed and sent to the Graveyard in the middle of the chain by "Torrential Tribute". )This is no longer correct due to the removal of Ignition Effect priority. This card's Ignition Effect cannot be activated in the Summon response window.